Items for Halfway House - Remember to bring in your contributions in the morning. Mary Harrison and Jean Pierce will be setting out our spread of goodies... and the Pimms too. 4-ball Vouchers for Auction – Send your bids to vicecaptain@chesfielddownsladies.co.uk or text 07771 531121 or you can bid on Charity Day. Bidding closes 12 noon 16th June. Choose from Welwyn Garden City, Mill Green, Mid Herts, and Bishops Stortford Golf Clubs. Thursday 30th June - Quiz night has been cancelled due to low numbers. Friday 15th July – Chesfield Downs Golf Club 25th Anniversary Gala evening. The Sign up sheet will go up on the Social Notice board at the end of this week. With 3 course meal, disco, magician and fun photo booth – it will be amazing!!! Don’t miss it!!! Round 1 23rd June – sign up on HowDidIDo as usual. Round 2 30th June– A sign up sheet will be added to the Ladies notice board after Round 1. Ladies with the lowest gross score from Round 1 will play last. Please check the board for your tee time for Round 2. Spare tee times will be available for the earlier tee times. Round 2 of our Club Championship will be followed by the presentation of Champions’ trophies to the winners plus tea and cake for all. Scratch Match – Another fantastic result for the Scratch Team against Harpenden this week. An excellent 4 ½ : ½ WIN with Sarah chipping in a birdie from the bunker on the 18th to achieve the half in her match. This makes 3 wins from 3 matches this season. BRILLIANT !!! Fabulous 27 degree hot and sunny weather was such a fabulous contrast from the 12 degrees of a few days before. The tough Championship Arden course faced us on day one. Pairs betterball runners up were Pat Ward and Pauline Humphrey. The winners were our brilliant organisers - Jackie & Sarah. Sarah Faircliff won the longest drive both days – absolutely huge drives (and on the fairway too, Sarah!) Nearest the pins were won by Hazel Brunnen and Brigid Kerr. 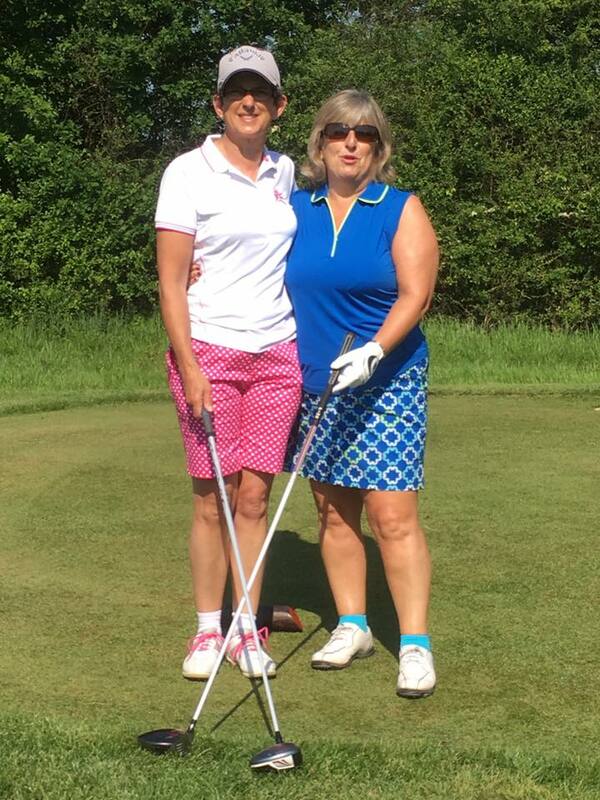 Day two was individual Stableford, with Lauren Pitcher taking 1st place and Christine Newcombe in 2nd on countback from Patti Vincent and Kathy Dale. Lots of fun and laughter was had over the three days. Thank you to Sarah Faircliff and to Jackie Reid for arranging such a wonderful weekend. Everyone had a fantastic time and I am really looking forward to next year! We all said our sad farewells to Brenda Harrington, who is moving to Shropshire. We will miss her smiling face, her thoughtfulness - and her joking comments.